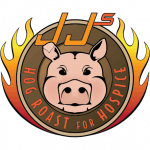 The second annual J.J.’s Hog Roast for Hospice was held Aug. 25-26 and raised $4,530 for Hospice of the Red River Valley. The two-day event, which featured music, a car and bike show, and a traditional hog roast meal, was held in Pelican Rapids, Minn. Over the past two years, this event has raised $5,636 to help provide hospice care to patients and families. The event was sponsored by A1 Radiator Service, Dewey’s Septic Service, Wanzek, Dakota Paper, Northstar Safety Inc., Roamers 4×4 Club, Doug’s Optical, Pro Pallet and Cormorant Inn.